Positive strand RNA viruses are the single largest group of RNA viruses with 30 families. Nucleic acid is usually single-stranded RNA (ssRNA), but may be double-stranded RNA (dsRNA). 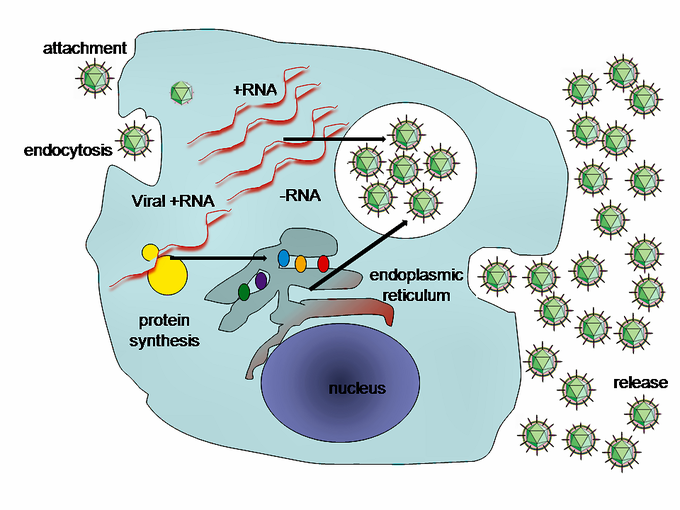 An RNA virus is a virus that has RNA (ribonucleic acid) as its genetic material. Notable human diseases caused by RNA viruses include SARS, influenza, hepatitis C, West Nile fever, and polio. virus: A submicroscopic infectious organism, now understood to be a non-cellular structure consisting of a core of DNA or RNA surrounded by a protein coat. It requires a living cell to replicate, and often causes disease in the host organism. genetic: Relating to genetics or genes. 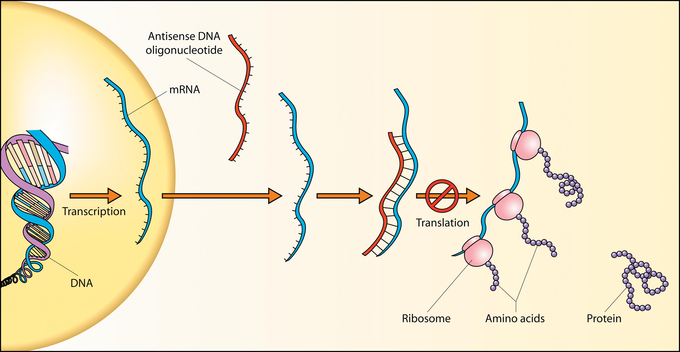 RNA: Ribonucleic acid (RNA) is a ubiquitous family of large biological molecules that performs multiple vital roles in the coding, decoding, regulation, and expression of genes. Single stranded RNA viruses can be classified according to the sense or polarity of their RNA into negative-sense and positive-sense, or ambisense RNA viruses. Positive-sense viral RNA is similar to mRNA and thus can be immediately translated by the host cell. Negative-sense viral RNA is complementary to mRNA and thus must be converted to positive-sense RNA by an RNA polymerase before translation. As such, purified RNA of a positive-sense virus can directly cause infection though it may be less infectious than the whole virus particle. 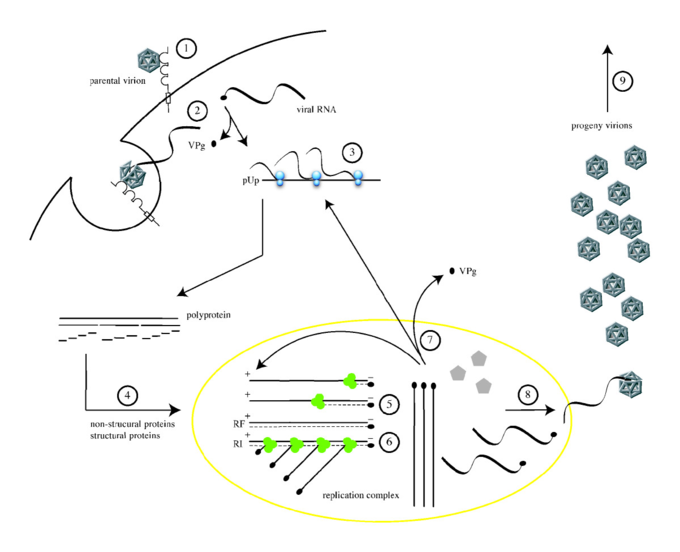 Purified RNA of a negative-sense virus is not infectious by itself as it needs to be transcribed into positive-sense RNA; each virion can be transcribed to several positive-sense RNAs. Ambisense RNA viruses resemble negative-sense RNA viruses, except they also translate genes from the positive strand. A common viral positive-strand RNA viruses that infect humans are the picornaviruses. 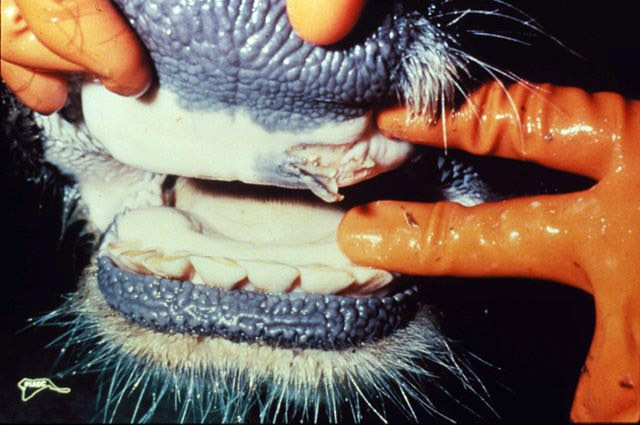 Foot and Mouth Disease: Foot and Mouth Disease is caused by the Aphthovirus virus which positive-strand RNA virus, of the Picornaviridae family of animal viruses. A picornavirus is a virus belonging to the family Picornaviridae. Picornaviruses are non-enveloped, positive-stranded RNA viruses with an icosahedral capsid. The genome RNA is unusual because it has a protein on the 5′ end that is used as a primer for transcription by RNA polymerase. The name is derived from pico, meaning small, and RNA, referring to the ribonucleic acid genome, so “picornavirus” literally means small RNA virus. Picornaviruses are separated into a number of genera and include many important pathogens of humans and animals. The diseases they cause are varied, ranging from acute “common-cold”-like illnesses, to poliomyelitis, to chronic infections in livestock. Additional species not belonging to any of the recognized genera continue to be described. Picornaviruses are separated into a number of genera. Contained within the picornavirus family are many organisms of importance as vertebrate and human pathogens, shown in the table below.Enteroviruses infect the enteric tract, which is reflected in their name. On the other hand, rhinoviruses infect primarily the nose and the throat. Enteroviruses replicate at 37°C, whereas rhinoviruses grow better at 33°C, as this is the lower temperature of the nose. Enteroviruses are stable under acid conditions and thus they are able to survive exposure to gastric acid. In contrast, rhinoviruses are acid-labile (inactivated or destroyed by low pH conditions) and that is the reason why rhinovirus infections are restricted to the nose and throat. Viral entry is the earliest stage of infection in the viral life cycle, as the virus comes into contact with the host cell and introduces viral material into the cell. Attachment to the receptor can induce the viral envelope protein to undergo changes that results in the fusion of viral and cellular membranes, or changes of non-enveloped virus surface proteins that allow the virus to enter. Virions enter the host cell through receptor-mediated endocytosis or membrane fusion. capsid: The outer protein shell of a virus. receptors: In the field of biochemistry, a receptor is a molecule most often found on the surface of a cell, which receives chemical signals originating externally from the cell. virions: An entire virus particle, consisting of an outer protein shell called a capsid and an inner core of nucleic acid. Viral populations do not grow through cell division, because they are acellular. Instead, they use the machinery and metabolism of a host cell to produce multiple copies of themselves, and they assemble in the cell. The life cycle of viruses differs greatly between species, but they all share the same basic life cycle stages. A typical virus replication cycle: There are six basic stages in the life cycle of viruses: attachment, penetration, uncoating, replication, assembly of viral particles, and release. Attachment is a specific binding between viral capsid proteins and specific receptors on the host cellular surface. This specificity determines the host range of a virus. For example, HIV infects a limited range of human leukocytes. This is because its surface protein, gp120, specifically interacts with the CD4 molecule, a chemokine receptor, which is most commonly found on the surface of CD4+ T-Cells. This mechanism has evolved to favor those viruses that infect only cells in which they are capable of replication. Attachment to the receptor can induce the viral envelope protein to undergo changes that results in the fusion of viral and cellular membranes, or changes of non-enveloped virus surface proteins that allow the virus to enter. RNA viruses are classified into distinct groups depending on their genome and mode of replication. Positive sense, negative sense, double stranded viruses, and retroviruses are RNA viruses with different modes of replication. Positive-sense ssRNA viruses (Group IV) have their genome directly utilized as if it were mRNA. Replication of viruses involves primarily multiplication of the genome. The polarity of single-stranded RNA viruses largely determines the replicative mechanism. genome: The complete genetic information (either DNA or, in some viruses, RNA) of an organism, typically expressed in the number of basepairs. replication: Process by which an object, person, place or idea may be copied mimicked or reproduced. Replication of viruses primarily involves the multiplication of the viral genome. Replication also involves synthesis of viral messenger RNA (mRNA) from “early” genes (with exceptions for positive sense RNA viruses), viral protein synthesis, possible assembly of viral proteins, then viral genome replication mediated by early or regulatory protein expression. This may be followed, for complex viruses with larger genomes, by one or more further rounds of mRNA synthesis: “late” gene expression is, in general, necessary for structural or virion proteins. Viral replication usually takes place in the cytoplasm. DNA to RNA to protein: Schematic showing how antisense DNA strands can interfere with protein translation. Viruses that replicate via RNA intermediates need an RNA-dependent RNA- polymerase to replicate their RNA, but animal cells do not seem to possess a suitable enzyme. Therefore, this type of animal RNA virus needs to code for an RNA-dependent RNA polymerase. No viral proteins can be made until viral messenger RNA is available; thus, the nature of the RNA in the virion affects the strategy of the virus: In plus-stranded RNA viruses, the virion (genomic) RNA is the same sense as mRNA and so functions as mRNA. This mRNA can be translated immediately upon infection of the host cell. Examples: poliovirus (picornavirus), togaviruses, and flaviviruses. The replication cycle of poliovirus: The cellular life cycle of poliovirus. It is initiated by binding of a poliovirion to the cell surface macromolecule CD155, which functions as the receptor (1). Uncoating of the viral RNA is mediated by receptor-dependent destabilization of the virus capsid (2). Cleavage of the viral protein VPg is performed by a cellular phosphodiesterase, and translation of the viral RNA occurs by a cap-independent (IRES-mediated) mechanism (3). Proteolytic processing of the viral polyprotein yields mature structural and non-structural proteins (4). The positive-sense RNA serves as template for complementary negative-strand synthesis, thereby producing a double-stranded RNA (replicative form, RF) (5). Initiation of many positive strands from a single negative strand produces the partially single-stranded replicative intermediate (RI) (6). The newly synthesized positive-sense RNA molecules can serve as templates for translation (7) or associate with capsid precursors to undergo encapsidation and induce the maturation cleavage of VP0 (8), which ultimately generates progeny virions. Lysis of the infected cell results in release of infectious progeny virions (9). RNA viruses are classified into distinct groups depending on their genome and mode of replication (and the numerical groups based on the older Baltimore classification). Positive-sense ssRNA viruses (Group IV) have their genome directly utilized as if it were mRNA, with host ribosomes translating it into a single protein which is modified by host and viral proteins to form the various proteins needed for replication. One of these includes RNA-dependent RNA polymerase (RNA replicase), which copies the viral RNA to form a double-stranded replicative form, in turn this directs the formation of new virions. Viruses are released from the host cell following assembly. Once replication has been completed and the host cell is exhausted of all resources in making viral progeny, the viruses may begin to leave the cell by several methods. Viral exit methods include budding, exocytosis, and cell lysis. Budding through the cell envelope, in effect using the cell’s membrane for the virus itself is most effective for viruses that need an envelope. This process will slowly use up the cell membrane and eventually lead to the demise of the cell. lysogenic: Of, relating to, or causing lysis. Viral populations do not grow through cell division because they are acellular. Instead, they use the machinery and metabolism of a host cell to produce multiple copies of themselves, and they assemble in the cell. The life cycle of viruses differs between species, but follows the same basic stages. Viruses can be released from the host cell by lysis, a process that kills the cell by bursting its membrane and cell wall if present. This is a feature of many bacterial and some animal viruses. Some viruses undergo a lysogenic cycle where the viral genome is incorporated by genetic recombination into a specific place in the host’s chromosome. The viral genome is then known as a ” provirus ” or, in the case of bacteriophages a “prophage. ” Whenever the host divides, the viral genome is also replicated. The viral genome is mostly silent within the host. However, at some point, the provirus or prophage may give rise to active virus, which may lyse the host cells. Enveloped viruses (e.g., HIV) typically are released from the host cell by budding. During this process the virus acquires its envelope, which is a modified piece of the host’s plasma or other, internal membrane. Viral shedding refers to the successful reproduction, expulsion, and host-cell infection caused by virus progeny. Once replication has been completed and the host cell is exhausted of all resources in making viral progeny, the viruses may begin to leave the cell by several methods. Different types of virus have varying sites of synthesis and replication. For example, synthesis and replication for DNA viruses occur in the cell’s nucleus while it is usually the cytoplasm for RNA viruses. Virus assembly depends on the site of synthesis and such sites are the nucleus, endoplasmic reticulum, and the Golgi apparatus aka Golgi body. Aside from this, assembly also occurs in the viroplasm which is an inclusion body in a cell. When the virus has replicated and multiplied, they would want to leave the infected cell and infect other cells. However, they require an envelope to enclose the DNA as well as to bind with the other healthy cells so that they can infect. The viral envelope is the typical lipid bilayer, derived from the host cell itself and sources usually come from the nuclear membrane, endoplasmic reticulum, Golgi apparatus/body, and plasma membrane. It also depends on where the virus ‘bud’ off from the host. Budding is a method which viruses use to exit the cell. “Budding” through the cell envelope, in effect using the cell’s membrane for the virus itself is most effective for viruses that need an envelope in the first place. These include enveloped viruses such as HSV, SARS, or smallpox. Prior to budding, the virus may put its own receptor onto the surface of the cell in preparation for the virus to bud through, forming an envelope with the viral receptors already on it. This process will slowly use up the cell membrane and eventually lead to the demise of the cell. This is also how antiviral responses are able to detect virus infected cells. Other methods for exit would be cell lysis. This method releases the virus from the infected cell by bursting its membrane and this kills the cell as well. Another method is by accumulating the virus particles in vesicles and releasing them via exocytosis. Exocytosis is the process where vesicles containing the virus are secreted/excreted out of the infected cell. Positive-strand RNA mature virions are infectious. Virions are released following cell lysis. Excess capsids are formed and inclusion bodies may be seen in the cytoplasm. 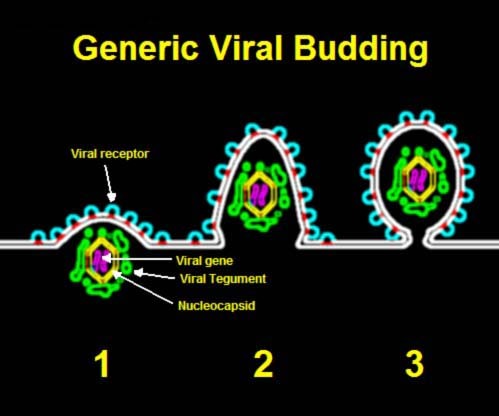 Generic Viral Budding: Viral budding uses the host’s cell membrane eventually causing cell death.